We are still experiencing the Spring time weather fluctuations here in Charleston, SC but thankfully the water has warmed up a bit and when the weather is good, the fishing has been good also! Captain Braden Powell has had plenty of tough days on the water recently, but there have also been some really really good times. We have still been targeting the Redfish on and around the low tide and especially the am low tides. It won't be long now until the fish are up in the grass feeding on crabs and waving their tails around for us to see! We at FishWater Outfitters have been fishing some different water recently, looking for new spots and checking on old spots that we haven't fished in a while. That is one of the best things about the Charleston, SC area. We are surrounded by so much water that we don't have to fish the same small areas everyday. A few days ago, Captain Braden took one of his local clients South of Charleston to the North Edisto river, out of Cherry Point Boat Landing in Rockville, SC. This area is really beautiful with very few houses and mud flats and oyster mounds everywhere. It is an area that we fished almost exclusively about four to five years ago. This was the first time that Captain Braden had been down there in 2018 and the weather and tides were perfect for a sunrise charter on the flats. 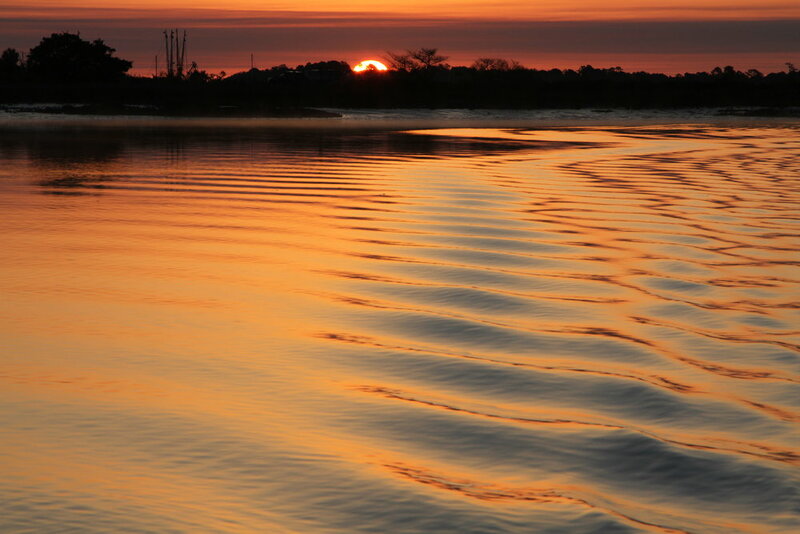 We had launched the boat at 7 am just as the sun was coming up and the tide was almost at dead low. The first flat that we went had a lot of juvenile redfish on it and a few good sized fish. After sight fishing to some of these fish we decided to go up the North Edisto River into Wadmalaw Sound. The Sound is full of very fishy spots that have mud flats, oyster mounds, big creeks and small tributary creeks. We ran over to a spot that we used to fish regularly and found that there was a big group of about 40 redfish bunched up at the mouth of a tributary creek. As the tide was just now starting to come back in, these fish would hold in the current right at the mouth of the creek and wait for a meal to come floating by. There were times that we could see fish tailing in the mud and other fish with their backs out of the water pushing around looking for food. Thankfully, we were able to catch some here and then head on to the next spot. As we continued our day, the tide flooded in really fast and the wind also decided to pick up and start cranking out of the South/SouthWest. Being in a large sound, we weren't able to find as much lee from the wind as we would have liked but still were able to use it to our advantage and have the wind at our backs. As the water rose, the fish also started to push up on the grass edges and float with the incoming tide. Its always great to see 'floaters' as they are just a few inches below the surface and still provide great sight fishing opportunities. Captain Braden Powell and his guest decided to try some soft plastic artificial lures that allowed them to pole up and down the grass edges casting for fish that might not otherwise be seen. This technique worked very well and they caught a few more fish! After 5 hours of great fishing and a beautiful morning they decided to head back to the dock to get home in time to watch The Masters. 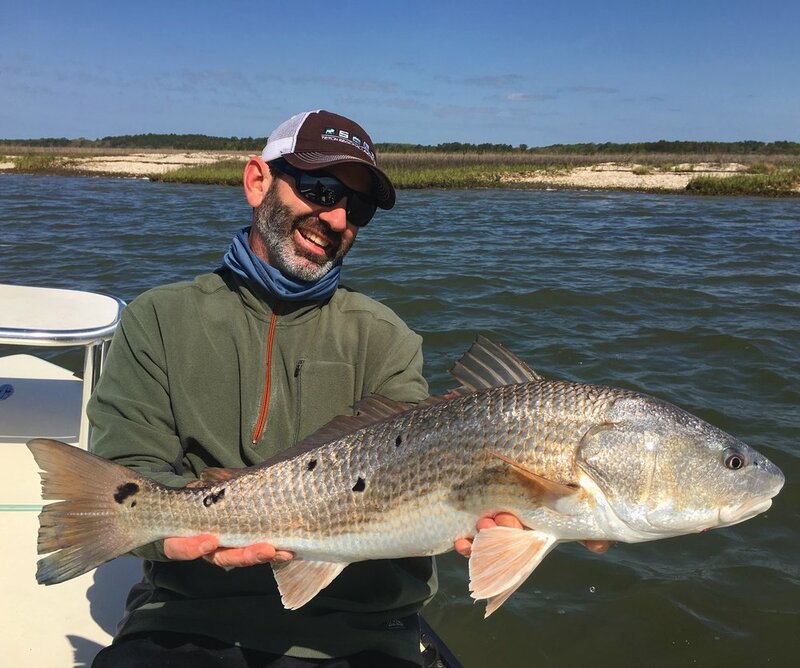 Charleston, SC offers some of the best saltwater fly fishing and inshore light tackle fishing in the south and with so much water surrounding us, there is always a place to go and search for Redfish to be caught! 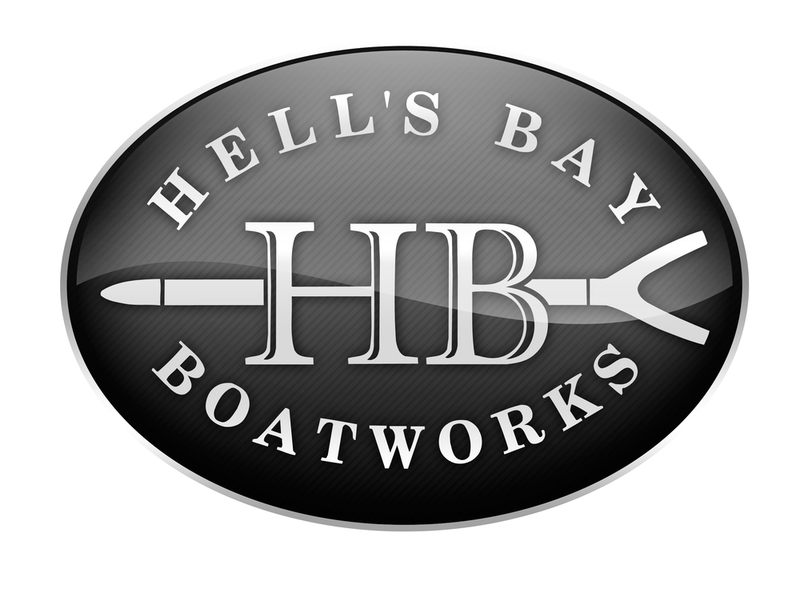 If you are visiting Charleston, SC for business, vacation or live near by and are interested in an inshore light tackle and fly fishing charter with FishWater Outfitters and Captain Braden Powell please click below to schedule your trip! Also, if you are interested in fly fishing trips in Montana from the town of Ennis, don't forget that FishWater Outfitters and Ennis, MT fly fishing guides will be there from June to October fishing daily on The Madison River. 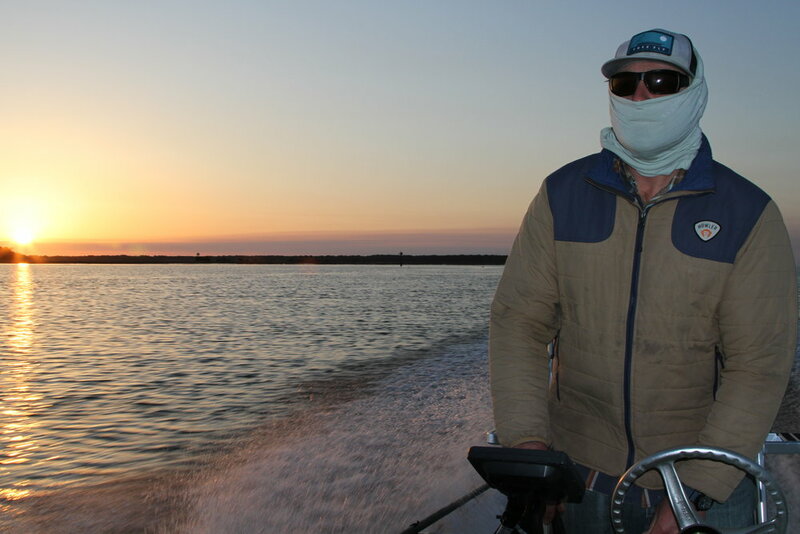 Whether in the beautiful Lowcountry Marsh surrounding Charleston, SC or floating down the Madison River in Ennis, MT, FishWater Outfitters and Captain Braden Powell will help you have a great day on the water and hopefully catch that fish of a lifetime!